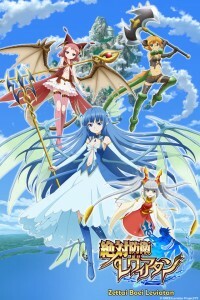 Based on a mobile game by GREE in Japan, Zettai Boei Leviatan is set on the water planet Aquafell and is populated by elf-eared dragon people. 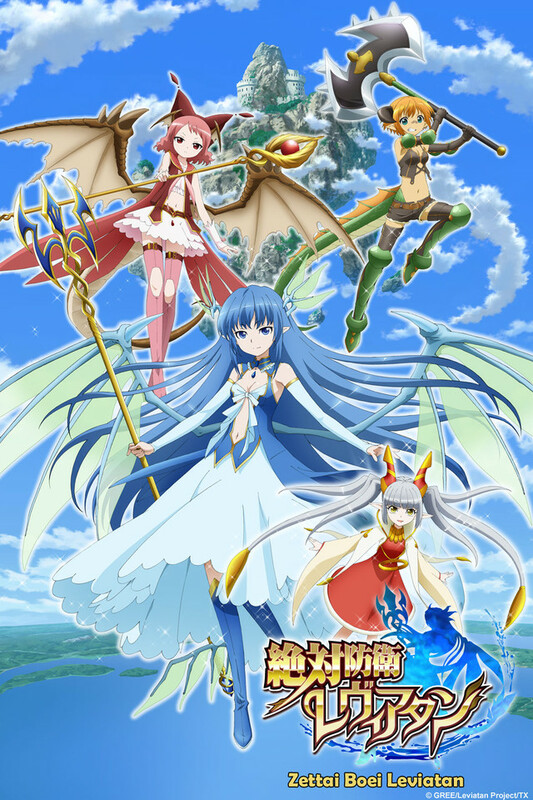 So far, in this first episode, it appears to be setting itself up as a magical girl adventure story, introducing the world, the world’s Creation Myth, and three main characters who wield staves and call upon elemental magic. Leviatan is a water magic user with a missing older brother. Her personality is one of stereotypically fluid emotions, as per the water theme, and she can apparently transform at will into a magical girl outfit reminiscent of those from Magic Knight Rayearth. Bahamut is the red headed fire mage, daughter of an apparently important mage and, finally, Jörmungand is a sturdy and strong wielder of an axe – probably the earth element of the trio. Syrop is a fairy that attaches herself to Leviatan as a ‘friend,’ and beyond having a gargantuan appetite she appears to serve a purpose similar to Link’s Navi – “hey, look! There’s an invasion!” From the beginning, Syrop is on the annoying side of cute so we’ll see if she stays there. I’ll be interested to see how close this show runs to Rayearth, as at first glance it made me think it was just a knock-off, but the first episode has put some space between the two and hopefully continues to develop its own identity. I’m also curious to see how much it draws on the real life mythology behind the characters’ iconic names. It doesn’t explain much in the way of culture or plot in the first episode, but the setting appears to be generic fantasy, even referring to its shops as ‘armor and item shops’ in an RPG fashion. The character designs and themes are pretty standard – not bad but not terribly unique either. The means by which the main characters meet each other is contrived but amusing, making me believe this anime is setting itself up to be a lighthearted romp rather than a serious adventure story. Leviatan’s dismissal of news about impending doom artificially diminishes that story thread, leaving the remaining hooks at the end of the first episode as the missing brother and a destroyed bar. In the end I don’t expect much depth or epiphany from this show but the animation and acting are decent and the potential fluff might just be fun enough to hold my attention.